This is a very easy craft because it is mostly already done for you. Basically just print out a color template or a black and white template (if you want to color them in yourself). If you want to make them sturdier, you can glue the print out to cereal box cardboard first, but it isn't necessary to do this. Print out the template, then cut it out. Then fold on the lines and then glue the tabs in place. Let it dry and then use it to display Christmas candy. 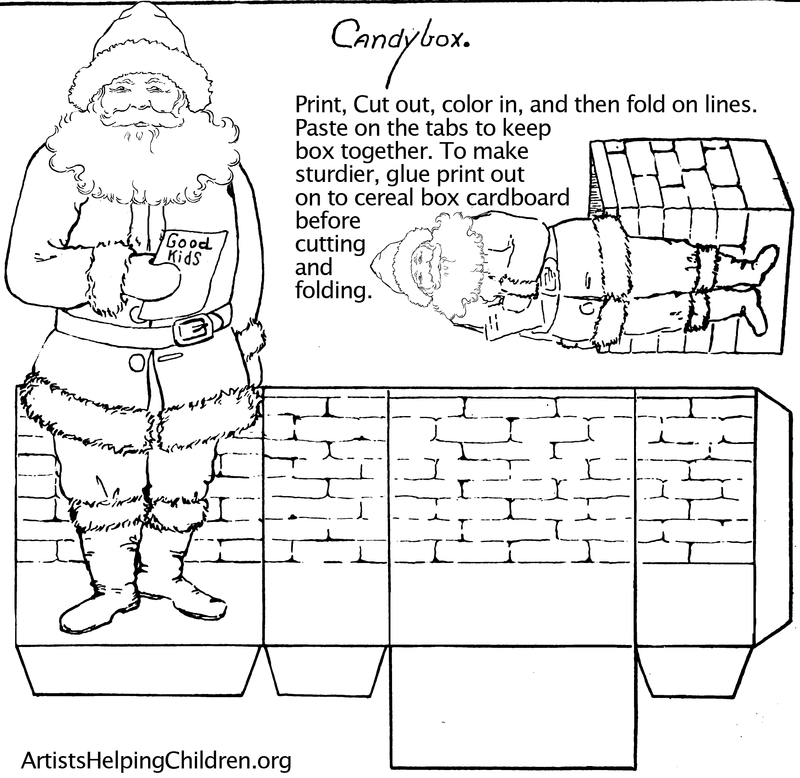 This is an easy Santa Clause craft. This is a printable craft...just print out this Foldable Papercraft and then color it in with markers, crayons, colored pencils, etc. Then just cut on the solid lines and fold on the dotted lines. Fold the paper together to make a Santa sleigh. Then just put treats in it. You can make it more durable by pasting the paper to cereal box cardboard before cutting and folding...but this is an optional step. Making a Valentines Day Pinwheel Sweet Candy Gift Box Craft for Kids - We will show you today how to make a complex looking, but very easy to do, Valentine’s Day Candy Gift box with sweets or candies. 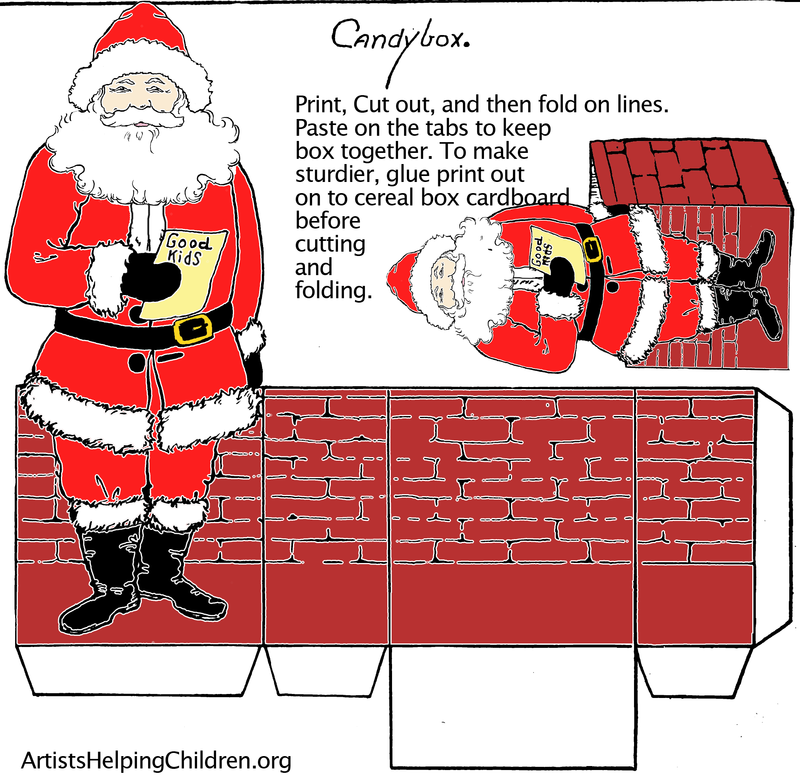 Santa Clause Gift Boxes - Learn how to make a Santa Clause Gift Box from a Milk Carton. Christmas Elf Gift Boxes - Make these Christmas Elf Gift Boxes for Christmas Gift Packaging from a recycled milk carton. Blythe's Bag in a Box Projects - Learn how to make cute gift boxes for your Christmas gifts. Chinese gift Carton Craft - Find out how you can turn a Chinese food carton in an amazing gift box. Christmas Card Boxes - Recycle your old Christmas cards to make cute boxes you can put Christmas gifts in. Christmas gift Boxes - Make a Christmas gift box out of old Christmas cards. Christmas gift Box Ornaments - Learn how to make amazing Christmas gift box ornaments by following these instructions. Egg Carton Holiday gift Boxes - This is a great gift box to give to your Grandparents! Festive Christmas gift Boxes - This festive Christmas gift box will brighten up someone's Christmas day. Fold Origami Boxes - Learn how you can easily make cute gift boxes out of greeting cards. Gift a Heartwarming Box of Pink Roses - Learn how to make this beautiful heartwarming pink roses gift box. This is perfect for a wedding or birthday gift. Gift Boxes - This tutorial shows children how they can make cute gift boxes out of inexpensive greeting cards. Gift Box for CD’s - Learn how to make a gift box that is the perfect size for a CD or DVD. Gift Box Tutorials - Create your own gift box using the printable template and the given instructions. Gift of Joy Christmas Boxes - Find out how you can make a "Gift of Joy" Christmas box for someone special. Halloween Gift Boxes - This gift box is easy to make and is perfect for Halloween presents. How to Fold a Cute Origami gift Boxes - This tutorial will show you how you could fold a cute origami gift box by yourself. How to Make an Easy Needlepoint Gift Box- Learn how to make a cute and easy needlepoint gift box. How to Make a Simple gift Boxes - To make a simple gift box you will need an empty shoebox with lid, wrapping paper, tape, ribbon and a bow. How to Make Boxes Out of Papers - Find out how to fold your own gift boxes using paper. How to Make Gift Boxes From Greeting Cards - Learn how you can recycle your greeting cards and turn them into gift boxes. How to Make Origami gift Boxes - Follow these instructions to learn how to make an origami gift box. Make a Fabric Gift Boxes - Create this fabric gift box for someone special in your life. Matchbox Lockets - Find out how you can make this adorable matchbox locket gift box. Mouse Box for Valentine's Cards - Put all your special Valentine's cards in this adorable mouse box. Origami Boxes - Learn how to fold a simple origami gift box by following these instructions. Paper Box Crafts - Learn how to make a gift box using your printer, paper, scissors, glue and crayons. Paper Boxes and Stars - Make your own gift boxes with your kids in about two hours. Paper Heart Gift Boxes - Follow this tutorial and learn how to make your Valentine's the best heart gift box. Paper House Boxes - Learn how to make a unique gift box that has the shape of a house. Pillow Boxes - Find out how to make a pillow box for your gift to someone special. 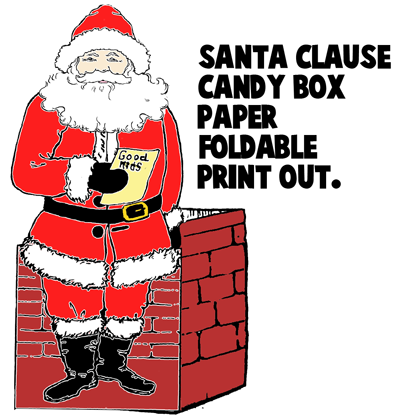 Santa Design Christmas Boxes - Print this box template and follow the instructions to make a Santa Claus design gift box. Snowman Design Christmas Boxes - Print this box template and follow the instructions to make a snowman design gift box. Sparkling Snowman Treat Boxes - Martha Stewart shows you how to make sparkling snowman treat gift boxes. The Jewelry Box Tutorials - In this tutorial you will learn how to built your very own jewelry gift box! Valentine Candy Gift Boxes - In this tutorial will show you how to build your very own gift box. This box is perfect for valentine candy gifts. Valentine's Day Chocolate Boxes Paper Crafts - This is a simple and fun Valentine's Day chocolate box craft for children of all ages. Vintage looking Santa Box - In this tutorial will show you how to build your very own Santa Claus gift box. Wire Mesh gift Box - Learn how you can make a wire mesh gift box for your homemade cookies.